Beautiful Day - Seize it! Look out. SO much is Happening!! The Continuation.....New Product is HERE! What a Girl will do for Paper Products! Have YOU visited the NEW SHOP yet? Oh my goodness. Are we being spoiled with this incredible weather! Don't waste this incredible day! Get out and enjoy. I forgot to mention that you MUST come downtown Chatham today! 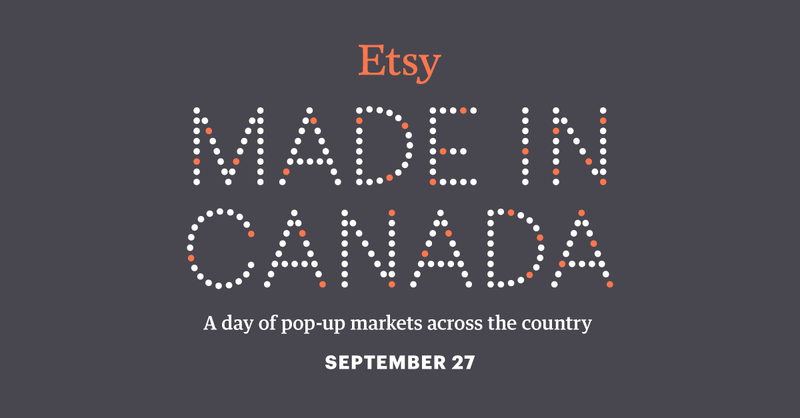 I the Made in Canada Etsy event is happening from 9am-3pm in front of the Downtown Chatham Centre (aka The Mall). 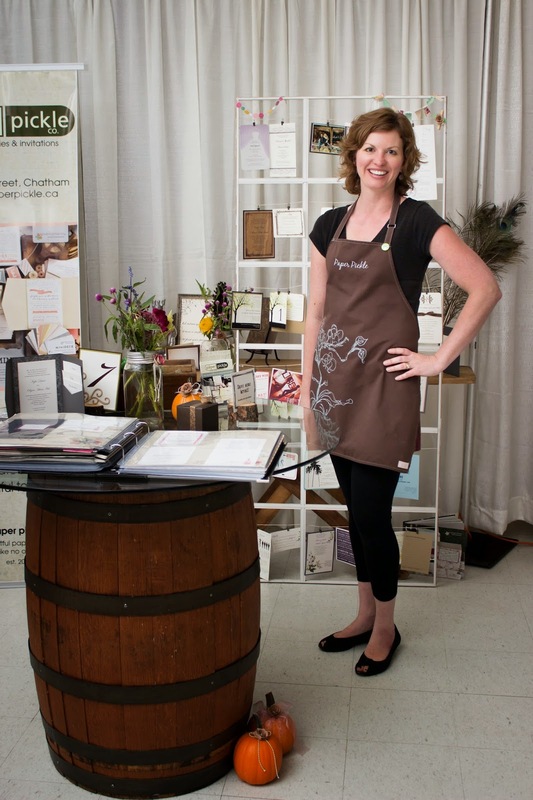 What a great opportunity to support our local artisans! 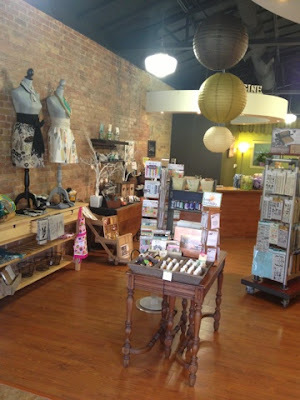 And don't forget to stroll our beautiful downtown and pop into our great boutiques. I've just got in another amazing order! 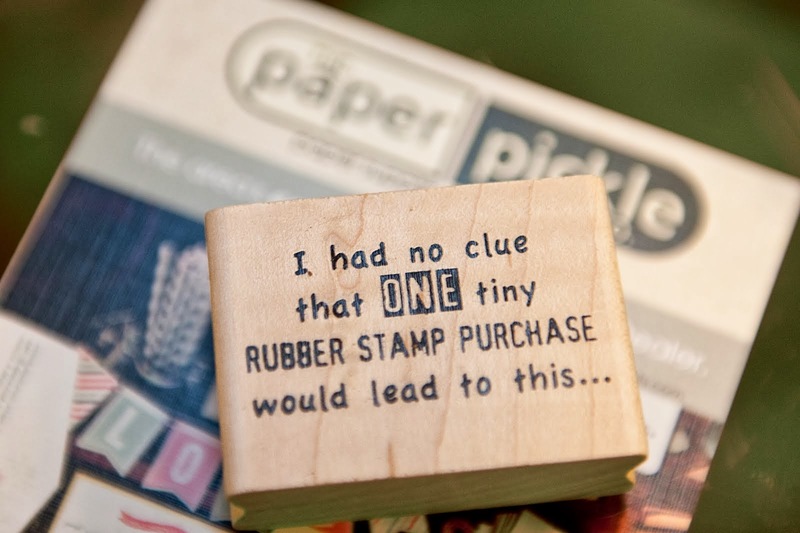 The most beautiful stamps from Magenta and the funniest stamps from Riley & Co! 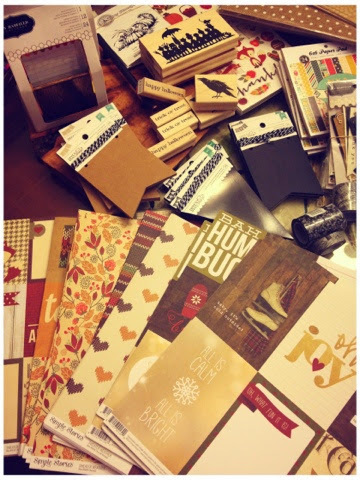 Incredible paper from various companies including Websters Pages and Simple Stories are here! Sorry for the short post but I've GOT to check out the Etsy event before I open the doors at 10am!! Remember we are open until 3pm today! 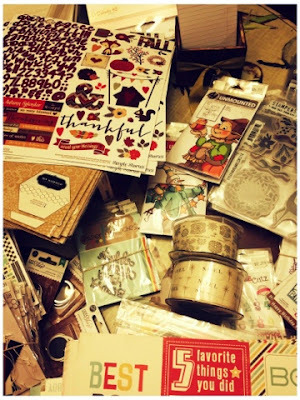 Paper goodies and sweets treats here!! 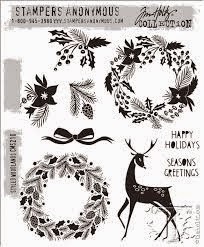 Any good paper crafter will tell you that holiday greeting card designs and gifty scrapbooking project are always on the mind no matter what time of the year you talk to them. Sure, we are all busier during the summer months boating, swimming, cottaging, gardening, etc. but even with all these activities, when you are out shopping in your favourite local paper crafting store, you are taking mental notes of items you like and may include on your special project this holiday season. 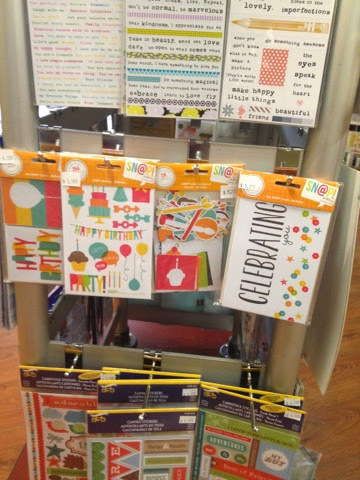 Another big shipment of Memory Box dies have arrived at The Pickle! This is our absolute favourite company in terms of design and quality. 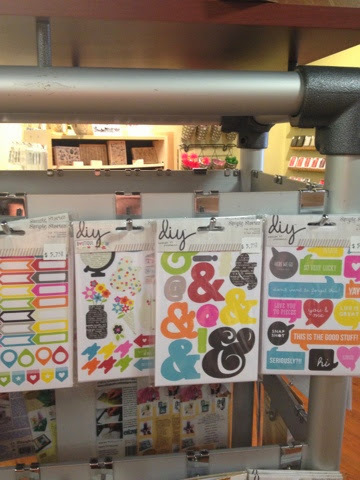 Just have a look at a few of the dies to grace our store! I know. I know. 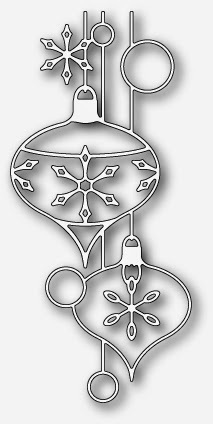 Looks like ornament overload but really everyone have a different style so I had to bring them all in! 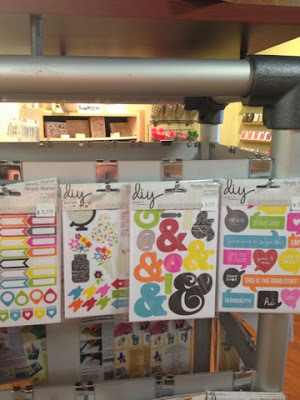 Besides, have you seen what the crafty bloggers are doing with these dies? 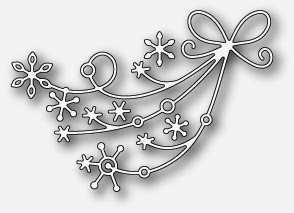 Just picture glittery pow papers, gold and silver mirror papers, white on white....it is all too beautiful! 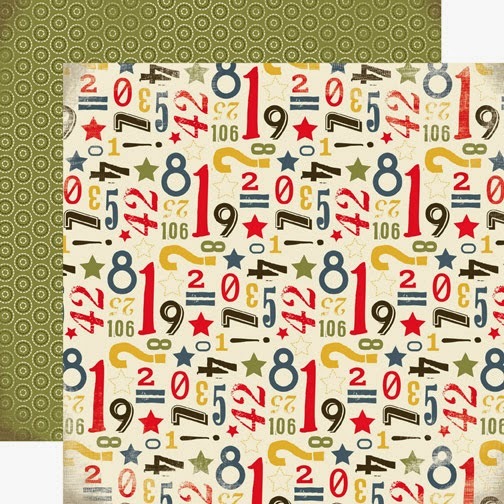 All of these designs work well on cards, page layouts, tags and more. Just play! I bet you will discover something new and AMAZE yourself! I know we have been open for a few weeks now, but it is time to celebrate and show you what we've got! Please join us as Jen and I celebrate the opening of our NEW joint store - The Paper Pickle and Homebaked Kitchen Company! There will be giveaway draws, taste testing, and more! Vickie will also be celebrating her move and expanded boutique that same day! Check out Lady Blackbird Boutique and Tattoos by Vickie. She too is planning special events to celebrate. More details to follow!! Adam from Lighten Up Photography got me to pose! The amazing Divine Details wedding show will be taking place at the Portuguese Club from 12-4pm and Paper Pickle and Homebaked Kitchen Company will be there. This is a great show and we are so excited to meet you there! Mark your calendars! Two years ago we had Nathalie from Magenta Style teaching in our store and it was incredible. 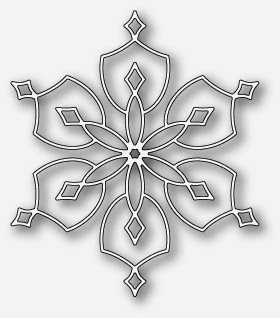 I am thrilled to tell you that she will be returning for two beautifully enjoyable classes. We are just firming up class times but I can tell you that there will be one in the evening and one through the day. 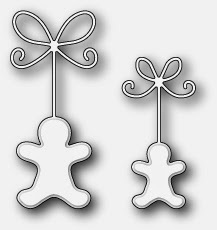 One class will be Christmas themed and the other more all occasion. Just be patient as I work out all of the details. I promise to share later this week! 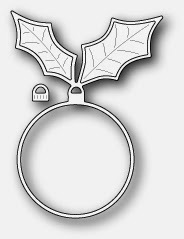 Tickets are still available for this year's Christmas edition. Check out the flier for details! 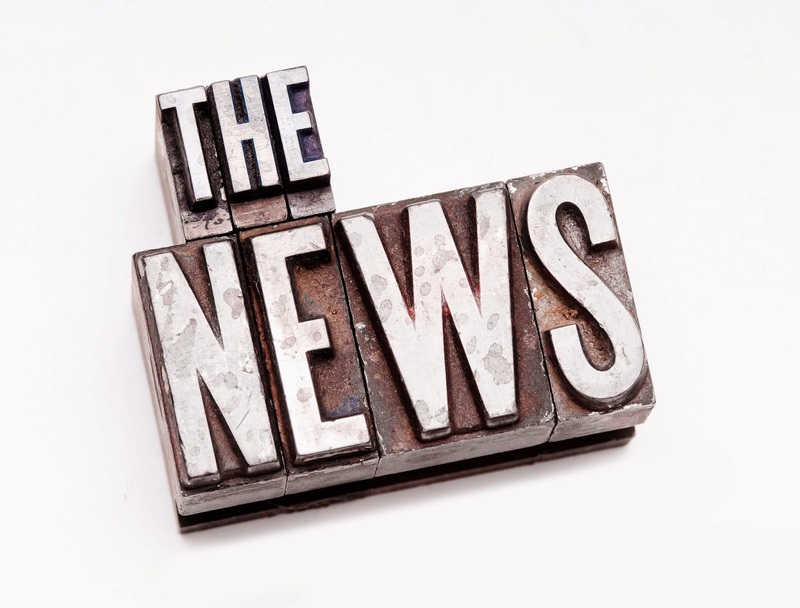 How is that for news?!?! I thought it was best to get the word out and fill in the blanks in future posts. Make sure to keep these special dates free as we would love to see you! Boy oh boy is right! I told you there was a lot of new product in our latest delivery. 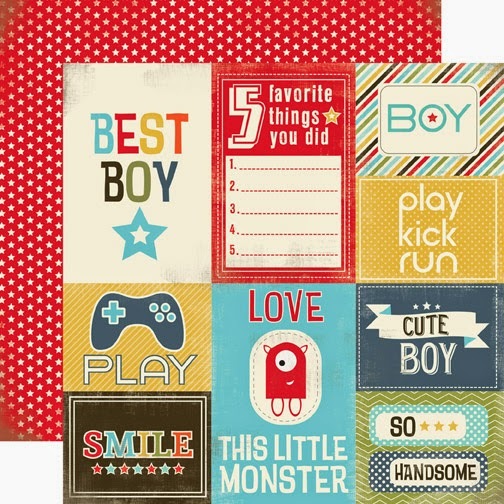 Anyone looking for great paper for boys, this is the line for you. 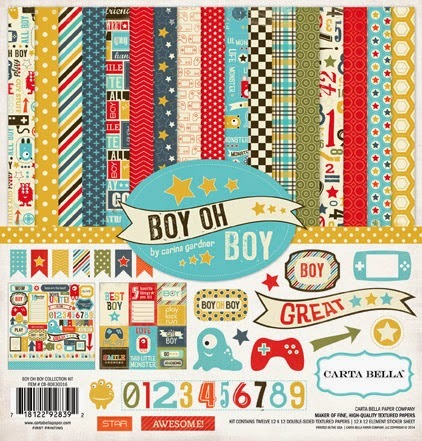 Check out Boy oh Boy from Carta Bella. I have never ordered in from Carta Bella before and I have to tell you I was pleasantly surprised|! Their paper has the same weight and beautiful texture as Authentique (one of my all time favourite companies). 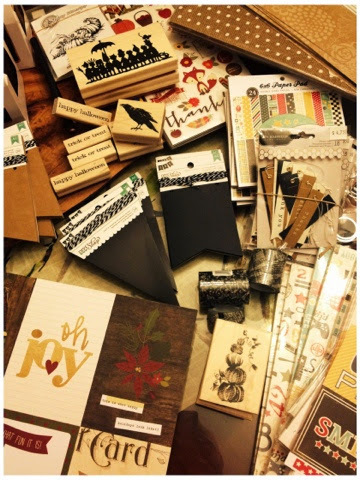 I have brought in pretty much everything from this line including 6x6 pads, 12x12 Collection kits and loose 12x12 designer paper. Great for little boy and teenage boys! Aren't these little guys cute? 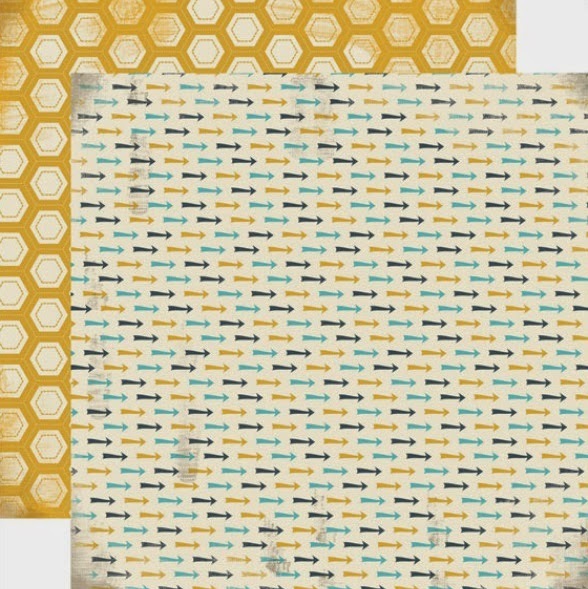 Great coordinating patterns on the backs as well! Jen Hadfield - NEW NEW NEW! Dress it up with embellishments or gorgeous enough to leave plain. 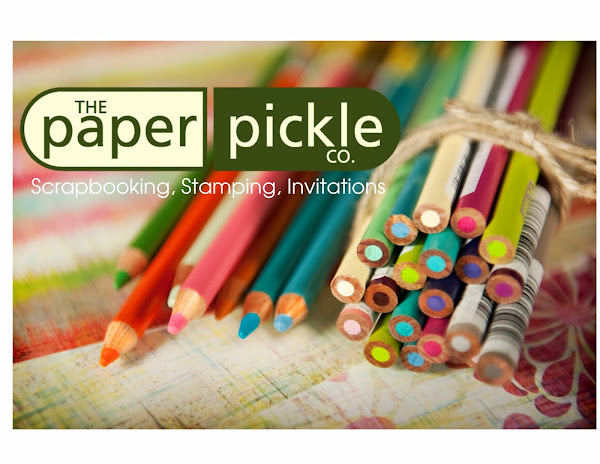 Here is another brand new company for The Paper Pickle. It is Jen Hadfield and all I have to say is that we may be twins. 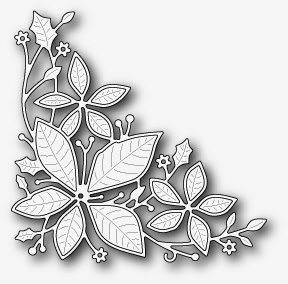 I mean if I designed for a paper craft company, this would be my style and my offering. Check out the gorgeous products here! 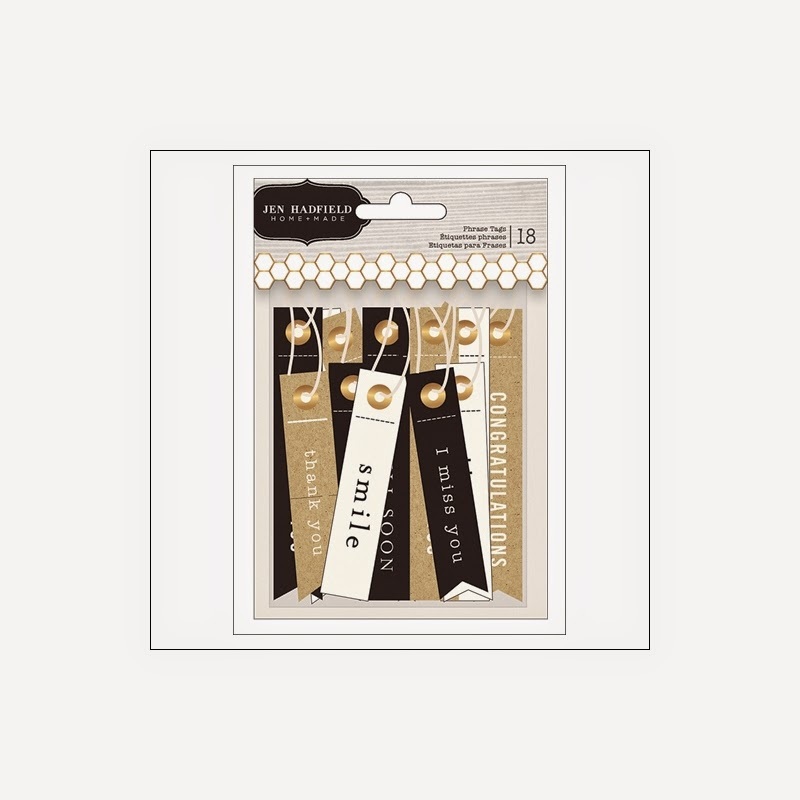 Phrase tags - the perfect addition to any card, page layout, gift or more! 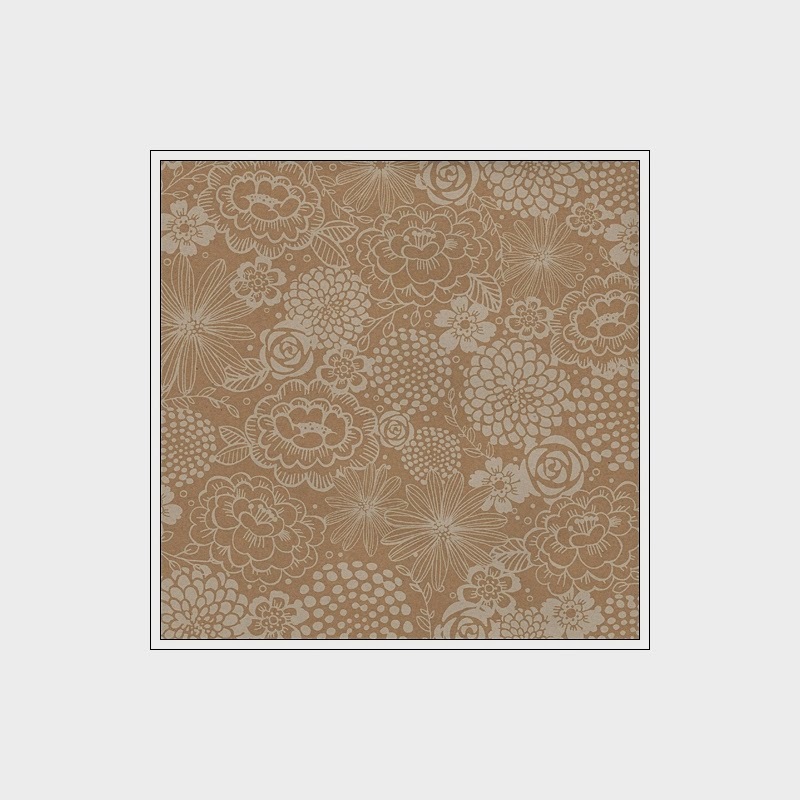 12x12 Kraft paper with white printed design. This is incredible in person! 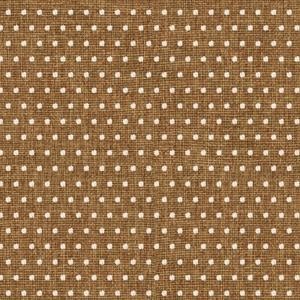 12x12 burlap sheets with white printed dots. This. Is. Awesome. The wheels in my head are already turning! I got more for ya tomorrow. 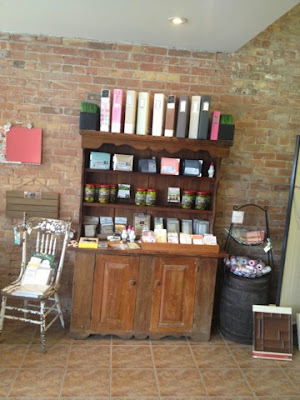 Or stop by and check out the goodies for yourself! Fall, Halloween and Christmas goodies. but also doubles as our receiving department on occasion! So I knew the order was to arrive Monday. Like the eager girl I am, I put a note on the door for UPS to deliver to our neighbouring business. I knew the guy usually delivers around lunch time so when I was out, I spotted a truck down the road from the store and proceeded to follow him until he stopped. So here I am behind some car repair shop lurking around while he delivers to the other business. I'm sure he found it strange for this girl to be lingering around looking for her parcel. Ha! Unfortunately the package was on another truck....Really! I later found out at 2:50pm (as stated on the UPS tracking page) the guy didn't deliver because we were closed and the package was to be rescheduled for delivery on Tuesday. NOOOOOO! Look at it all! See anything you like? So all day today, while working for the hubs, I kept monitoring the UPS tracking site. The "on truck for delivery" message gave me the hope I needed in the morning. But as the afternoon moved along, I knew the package was never to be delivered to my neighbour, who bless her heart, humours me as I chat on and on during each check in call about the amazing product in the order. I then called the 1-800 once again and arranged for a pick up at the warehouse. Did it really have to be that hard? I mean I could have just waited for the order to arrive Wednesday when we were open again but truly, I could not wait! The Paper Pickle receiving department was moving to my kitchen table tonight! Call me crazy but I HAD to check in this order myself! 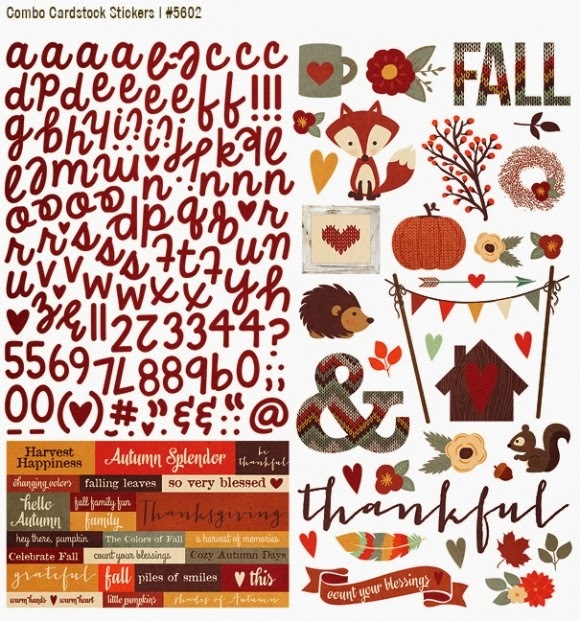 New ribbon, paper, kits, washi tape, stickers, stamps and more. But seriously, check out all of the amazing product! Can you now understand why I was so anxious to intercept the order? Ha! 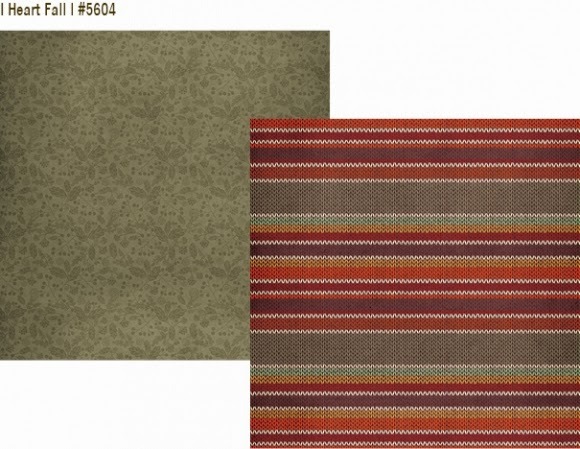 Lots of new lines that I am eager to show you! Have a little look at some of the products which found their way to the store. These are just a few of the items. 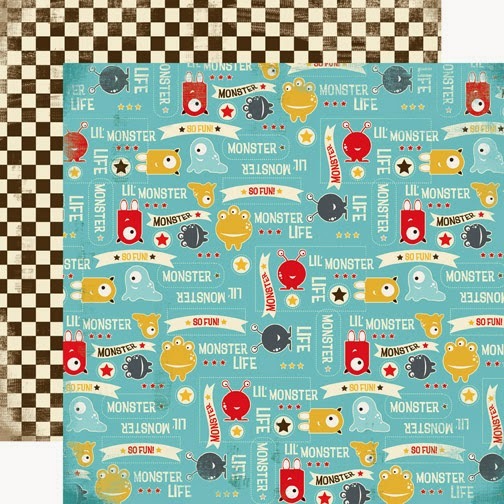 Perfect for Project Life style scrapbooking, tags, etc. 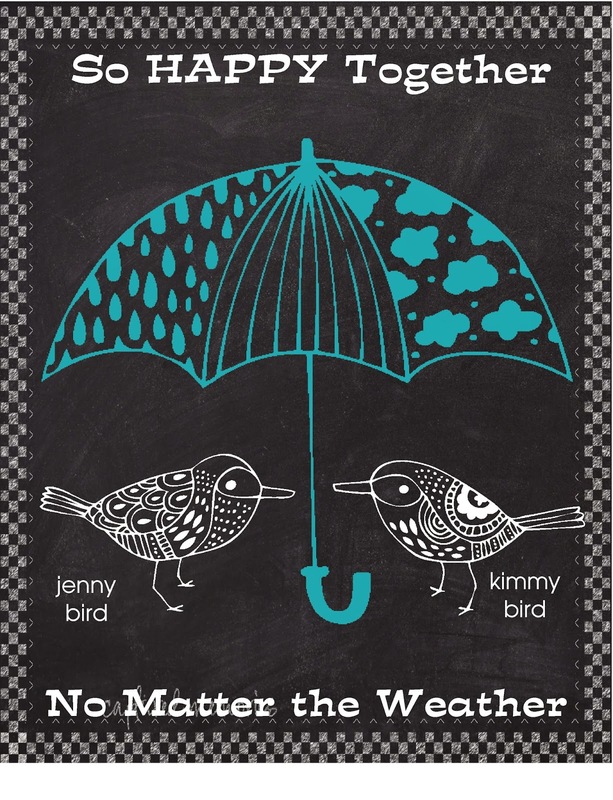 Don't let a rainy day get you down. 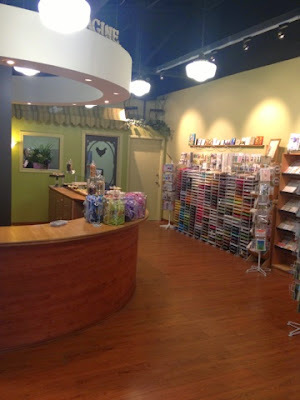 Join us BIRDS at Homebaked Kitchen and The Paper Pickle Company today. We have treats that are SURE to put a smile on your face! OPEN from 10am-3pm today!! 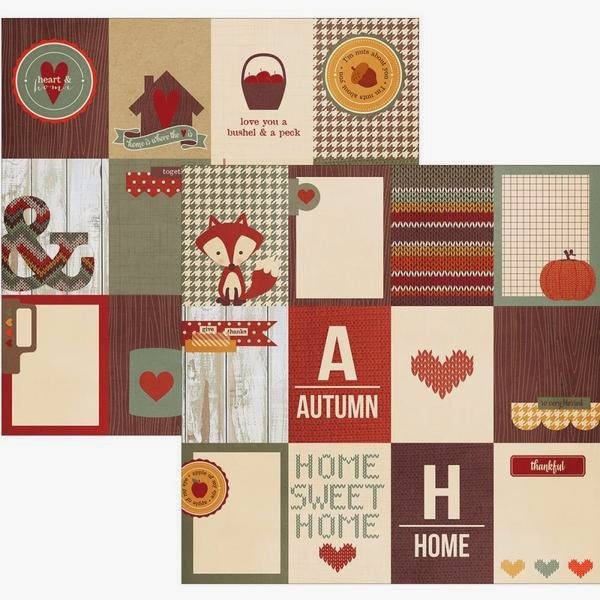 PS...Pauline's card class on October 15 has sold out! A couple of spots are left in her second date (October 22). Don't delay! Sign up today. 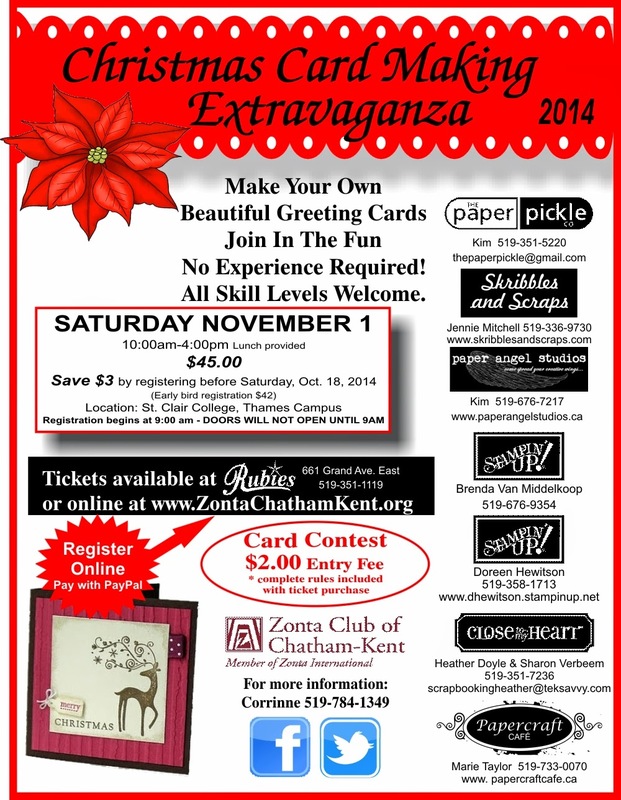 As promised, I will fill you in on the details about a gorgeous card class and the ever popular Zonta Card Making Extravaganza. Wow! We are back with a gorgeous card class. Two Christmas cards each offering different techniques. 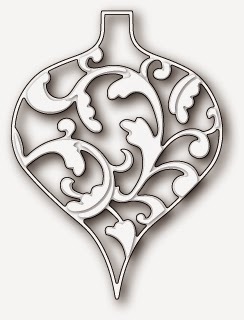 Try your hand at a white on white design and see why this is so popular today. 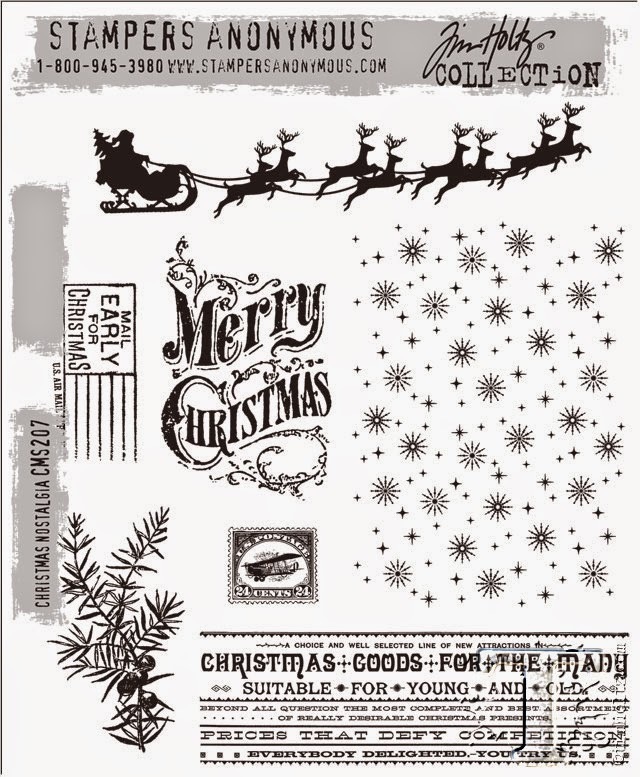 And work with a Tim Holtz blueprint die, embossing powder and see that by adding a little dimension to your card, you can really score some big points with your friends. 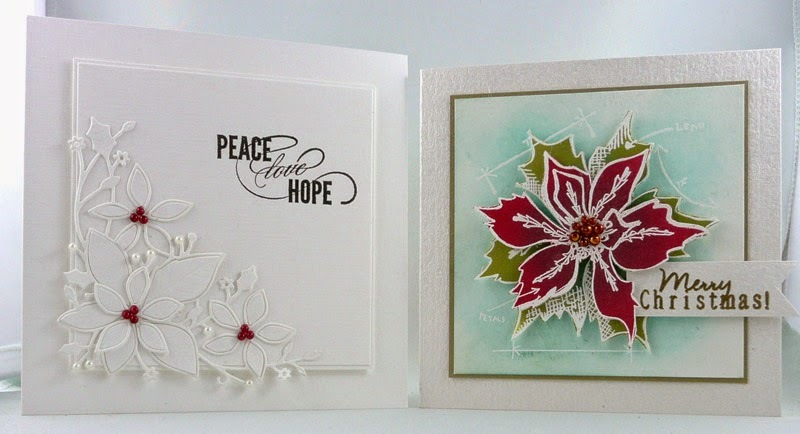 Two cards SURE to stand out on any Christmas card wreath! All levels of students welcome. Please call the store or stop in to register. No emails or blog comments please. *Please note that the class fee will include all other supplies required to make these cards as well as envelopes. We are also going to try something new! All registrants will get to choose a cupcake (simply vanilla, double chocolate, red velvet, lemon, raspberry, chocolate caramel) or cookie (chocolate chip, double chocolate chip pistachio, shortbread or snickerdoodle) of their choice to enjoy during the class. Please let us know your choice when booking the class! Please note that we are working on other classes including some home decor/wall hanging in a fall/halloween theme. Give us another week or so and we promise not to disappoint. We will keep you posted for sure! This wonderful event happens twice a year (spring and fall). The spring session was a sell out! Don't miss this opportunity. It is a wonderful day filled with lots of leaning, lots of laughs and best of all, helping a great club! All of the details are included on the poster above. You can come into the store to pick up your registration or sign up on line! Please note that registration will only be accepted at The Paper Pickle until the early bird date (October 18). 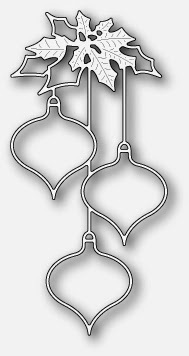 Here's something new....over the next couple of weeks, please email me requests on the technique you are hoping to see at The Paper Pickle's table. I'd love to hear what you are interested in learning!! 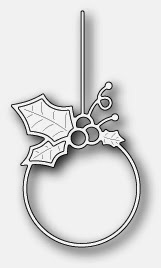 This will really help to focus me in my design because as you know, there are so many directions one can go when creating their Christmas card. Help me! Please help....Ha. Hope you are having a fabulous week! I'm finally feeling like I am getting back into the groove. Who's ready for a little picture story? Some stories are BEST told in pictures. Awww. I just love my new space and my new roomie. Have a look here or better yet, come on in! We'd love to see you and welcome you to the new space. our famous ribbon jars and NOW Jen's incredible baking! (sign from The Gift Cabin in Erieau). This is a look from the front of the store towards the back. are a nice addition to the store. for your closest friend's birthday. She will love it! 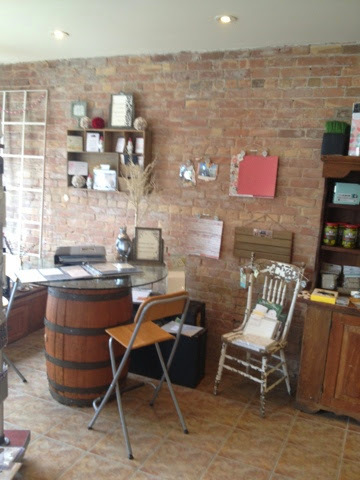 This is our stationery area. 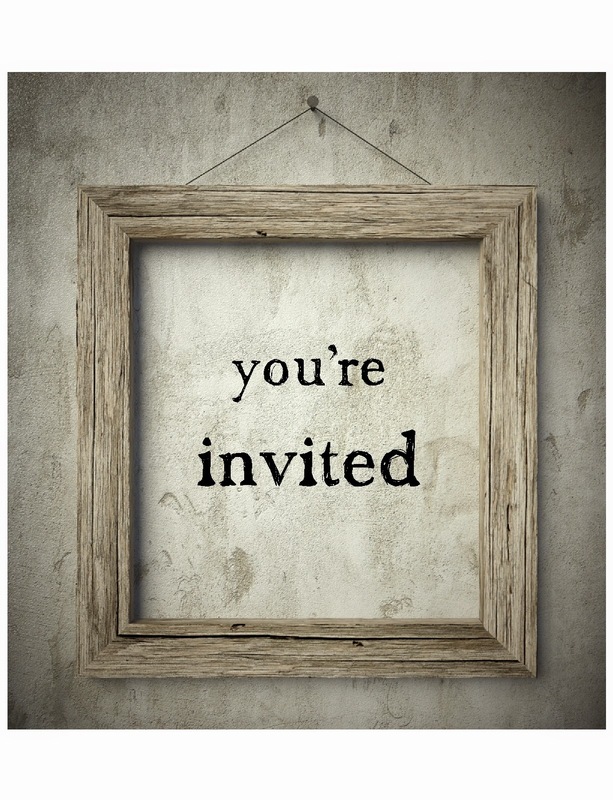 Did you know that I design custom invitations for ALL occasions? Make an appointment and let me create something beautiful for you! 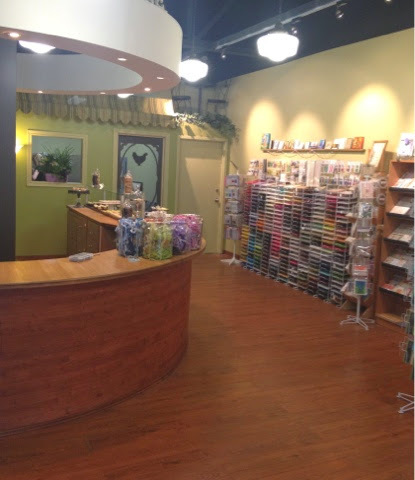 This is a look at the store as you walk through the front door. which are grown and packaged locally! 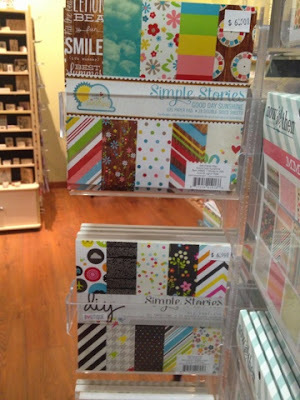 We also have a great selection of scrapbooks. 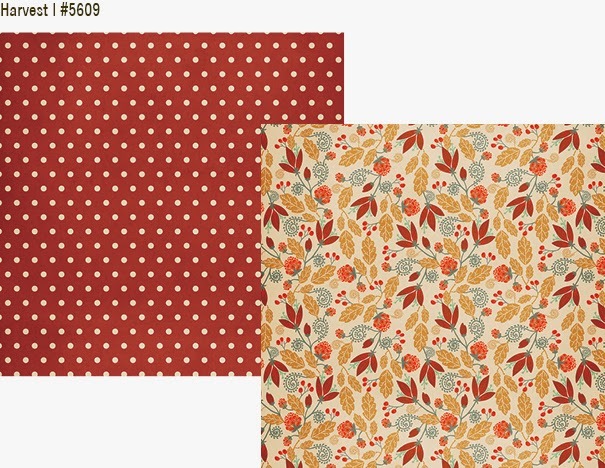 If you are into Project Life or Instagram albums, we've got you covered. If you don't see what you are looking for, just email me your request. 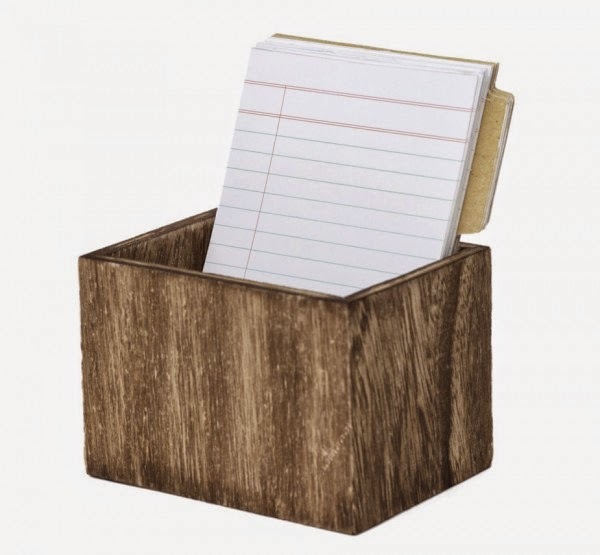 I would be happy to order items for you! Can you tell I am just a little bit proud of the new space? Ah you guys....life is good. Oh darn....I should have taken a picture of Homebaked Kitchen's counter today. It is so pretty with her cupcakes, french macarons, cookies and sweetie pies (she has APPLE cinnamon today!). 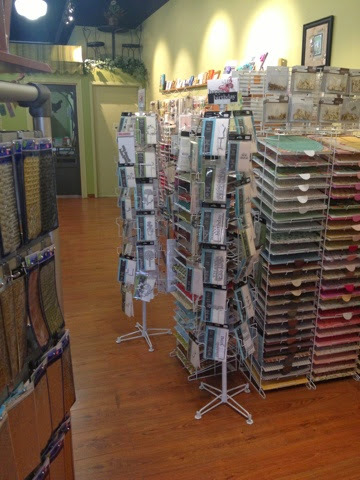 THE largest selection of dies in the area. Brands include: Memory Box, MFT, Penny Black, etc. you look like a superstar crafter. 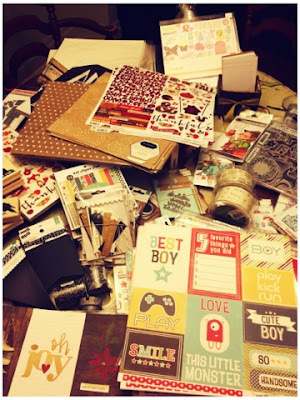 PS...I hear an order from Memory Box arrived today! 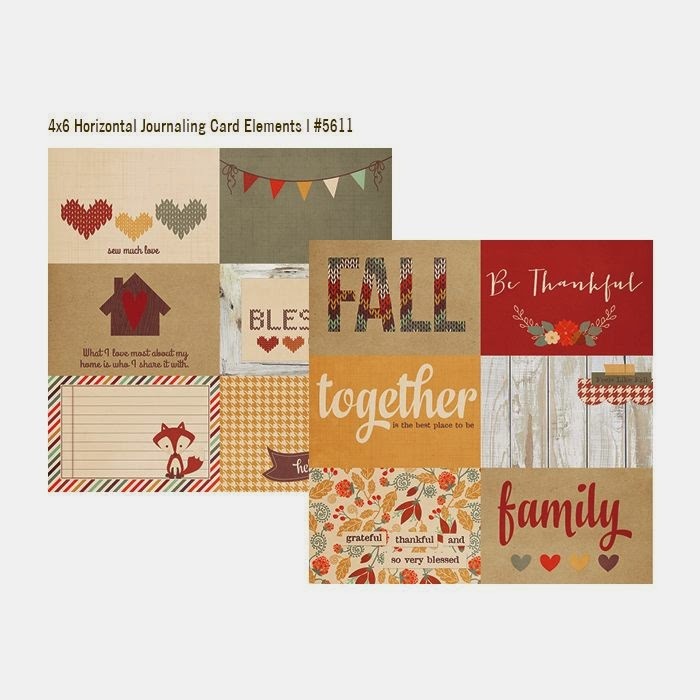 Also, tomorrow I will post about an upcoming class (October 15th with Pauline) and the Zonta Card Making Extravaganza (November 1st! ).